The Department of Arts, Culture and Media invites you to the fourth Music Matters event of the 2018/2019 Lecture Series. In collaboration with this years KIEM project, we invite L.J. 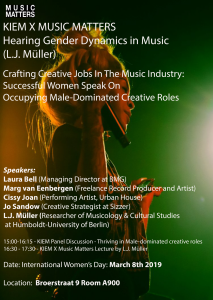 Muller to give a lecture on sound and gendered performances in popular music. This entry was posted in Uncategorized on 2019-02-12 by admin.